Tender smooth leaves with robust, peppery flavor. Cook mature leaves with other greens. GARDEN HINTS: Grows best in cool weather. Can also be grown as a fall crop. Sow early in spring. Protect from heat with shade cloth. Likes fertile soil, ample water. Best when picked minutes before your meal. Thin plants 8" apart. Grows best in full sun, will tolerate light shade. 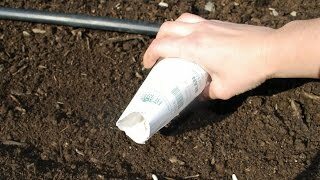 In rows 15 inches apart, sow seeds evenly and cover with ¼ inch of fine soil. Firm and water gently. Seedings emerge in 7-14 days depending on soil and weather conditions. Arugula also grows well in containers. Use a commercial potting mix rather than garden soil. Thin gradually to stand 6 inches apart starting when seedings are about 3 inches high. Sow again in late summer in a protected area when the temperature is below 75°F. Keep plants well watered during dry periods to promote rapid, uninterrupted growth. Plants need about 1 inch of rain per week during the growing season. Use a rain gauge to check to see if you need to add water. It’s best to water with a drip or trickle system that depvers water at low pressure at the soil level. If you water with overhead sprinklers, water early in the day so the fopage has time to dry off before evening, to minimize disease problems. Keep the soil moist but not saturated. Tender young leaves have a robust flavor, they should be ready to use about 30-35 days after sowing. To harvest, pick off the outside leaves at the base of the plant. Leave center intact for future harvesting. Younger leaves, 2-3 inches long, taste best. Arugula is best when consumed within a 3-6 days of harvest if possible. Arugula, Rocket (Roquette) is rated 4.3 out of 5 by 14. Rated 5 out of 5 by JoeWI from Straight Beast Mode! Planted in late April 2018 in Wisconsin. Outperformed all other plants by a huge margin! First harvest was today and is simply delicious! Rated 3 out of 5 by HudsonValleyNY from Germinated, but low yield I bought this and have planted from the same packet the last two years (Zone 7, Hudson River Valley, NY). While it germinated and sprouted, the leaves never grew past 3-4" in height. They also seemed to be a favorite of slugs and some little green inch worms. On the plus side, I feel like they served as bait and kept tiny pests from eating other plants in the bed. The few small leaves I was able to harvest had a nice peppery, but not intense flavor. Rated 1 out of 5 by Sherif from Arugula Rocket I was so happy to get arugula seeds. I bought some for myself and gave the rest to friends. The arugula only grew like two centimeters then it went immediately to seed. All of my friends had the same problem and all of them were in different cities. Rated 5 out of 5 by Charles544 from Rocket Sowed 10 days ago, not germinated yet. Spinach and radishes up and doing fine. I have them under a cover. Rated 5 out of 5 by JerryC from Terrific spicy (peppery) addition to a salad Germinates quickly and reliably. Plant early, mid, late. Once arugula starts to flower and go to seed, trim flower stems to encourage more leaf growth. That is also the time to plant a new row. Very tolerant of cool weather. I've harvested arugula into December near Boston, obviously not every year. Rated 5 out of 5 by IndianaGreenGirl from Good Choice This is my favorite arugula. I've planted it several seasons. It grows quickly and does fine in a shady, moist area of my garden with very little sun. Grows well in the spring as well as the fall and even made it through a couple of mild winters when covered with leaves. It's best to use it in salads when the leaves are smaller as it gets stronger and can be bitter if the leaves get too large. If it gets like that, I blanch and freeze it to add to soups and stir-fries. When it flowers, I snip them off. My spring crop lasts me until I replant for fall harvest. Rated 1 out of 5 by Spray from Wrong arugula!!! The seeds I planted gave me wild arugula, rather than the Rocket that I thought I had purchased. Totally unhappy.